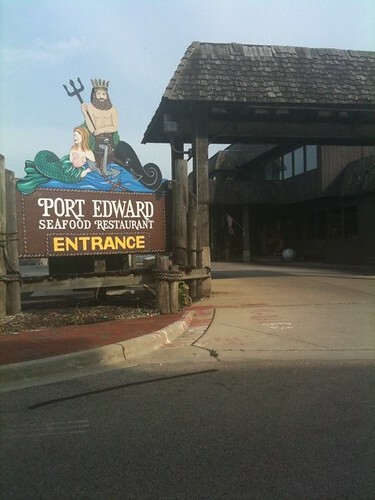 We dined at Port Edward in Algonquin, guests of Port Edward and McHenry County Visitors Bureau. The nautical themed restaurant and seafood menu has been a fixture of Algonquin and Fox River valley since 1952. It is a favorite fine dining locale for McHenry county residents and visitors alike. Owner Ed Wolowiec is a gracious host involved in all details of the restaurant. His background includes diving the oceans for treasure, classical musician and teacher. Ed designed and supervised the building of Port Edward Restaurant doing much of the work himself. You may see him driving around town in his classic Stutz Bearcat. Ed is active in the community including the Rotary Club. Here is Ed holding the 1st production Materra Merlot wine. The Friday night international seafood buffet and Sunday champagne brunch are highlights of the week. The selection of seafood treats is like no other you will find in the area. Limited vegetarian selections are on the menu. 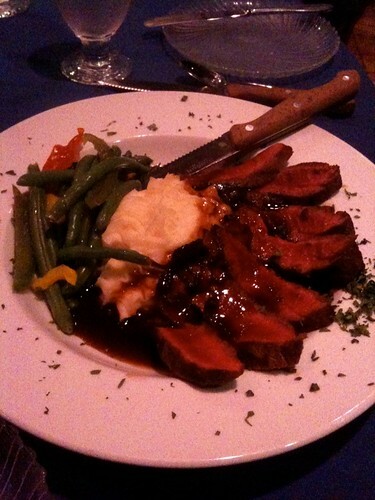 While known for seafood delights, Ed and Chef Randy have a little secret to share with you. Diners can customize their experience with a choice of seating options available in the spacious restaurant. The well lit main dining room offers accessibility for all and is perfect for everyone. For a romantic dinner, request a quite table in the Lobster Cove or Secret Room. The Red Room is often used for cabaret shows or special events. For those who plan ahead, reserve a table aboard the “Porpoise” up to one year in advance. Your party can enjoy a private meal while floating in the koi pond. Savor scenes that change with the seasons from the Salem Lounge’s over-sized windows overlooking the Fox River. Enjoy cocktails or dinner as the wood bar radiates a warm glow in the sunshine. Evening crowds range from after work business colleagues to girls night out to couples. Summer time dining dockside on the patio is a favorite for boaters who tie up and come ashore for lunch or dinner. Even dogs have their day with Tuesday evening outside Doggie Dine Out for owners and their pets. Chicago’s WTTW Check, Please! filmed a segment at the restaurant last year. We were there for the shoot and took video of their video taping. Our favorite was producer David Manilow pretending to dive into the huge dish of paella. You can keep up with Port Edward on Twitter and Facebook. Our visit was sponsored by Port Edward and McHenry County Visitors Bureau.